How to connect an IP camera to your PC or to the computer monitor? If you’ve got your security video IP cameras home, and you don’t plan for an NVR, you may get problems on how to directly connect an IP camera to PC (without routers, without internet, without DVR or without its receiver). This doesn’t mean you are an idiot, but you are just not a technical guy or you just don’t have experience in this kind of stuff. Pleased be noted: Install your security cameras in the right positions firstly. You can refer to How to Install Home Security Cameras Successfully. And I’ve covered third party software to connect your IP Camera to computer in the last part. 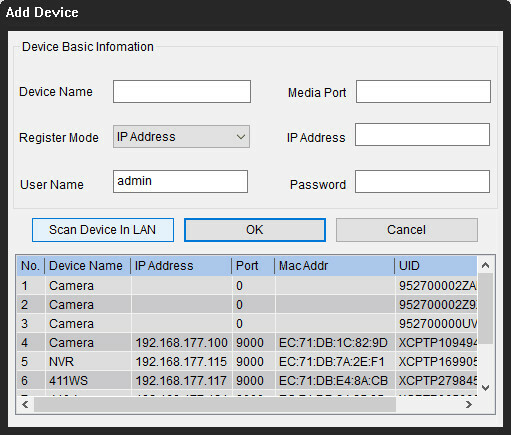 Those methods will guide you to connect a wireless or PoE IP camera to PC (on Windows 10, Windows 8.1, Windows 8, Windows 7, Windows XP and Windows Vista), and to a Mac (on Mac OS X 10.13, 10.12, 10.11, 10.10, 10.9, etc.). Important Note: The methods recommended below may NOT apply for the battery powered security cameras, which require initial setup on your phones. The steps below detail how to connect your security IP camera directly to PC/Mac, without an NVR or DVR, without a router network, without WiFi, and without any fees or complicated configuration. Alternatively, you can try the top 2 solutions for cameras without WiFi I have mentioned. Step 1. Get your security camera charged. Use the power adapter to get the camera plugged-in and charged. Normally, when you buy a WiFi IP camera, it comes with a power adapter. For a PoE camera, ask the supplier and buy one that’s workable for the camera. Step 2. 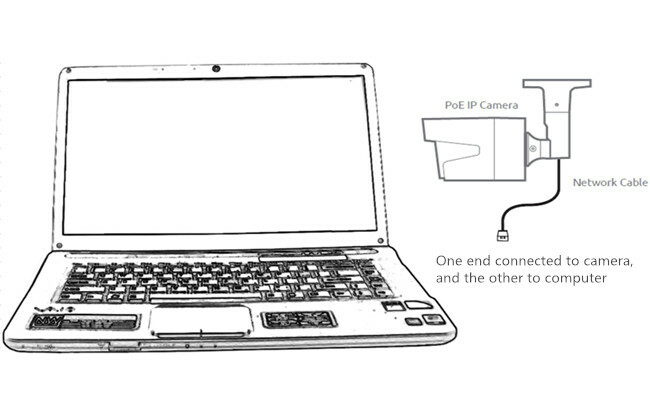 Use the network cable to connect to the camera and the computer. Normally there would be a 2-in-1 or 3-in-1 cable attached from the camera. Find the network connector from that cable and use the network cable to connect to it. Then connect the other end of the network cable to the computer. If your computer has network already, disable it – make sure your computer is offline. Step 3. Scan and find out the security camera’s IP address on the computer. Now the security camera is connecting to your computer basically and physically. But you still can’t view the camera on the computer. What you need to do now is to scan and find out the camera’s IP address. There should be surveillance software from the same supplier with the camera. Take our test as an example. We have Reolink Client on the computer. Launch it and it will automatically scan all the cameras in the same local LAN and show the default IP address (every camera has a default and unique IP address when it leaves the factory). Easy peasy! Step 4. Change the computer’s IP address to the same network prefix of the IP camera. So in Step 3, you get your security camera’s default IP address. In our test, the default IP address of the camera we use is 192.168.177.100, and now you need to change your computer’s IP address to 192.168.177.x, where x identifies the node/host and is the number between 2 and 254. So let’s say the computer’s IP address is 192.168.177.12. IP address 101: An IP address consists of two parts – one belongs to the network address and one belongs to the node address. All nodes on a given network share the same network prefix but have a unique host number. 1) Press the Windows + R keyboard shortcut to bring out the Run box. 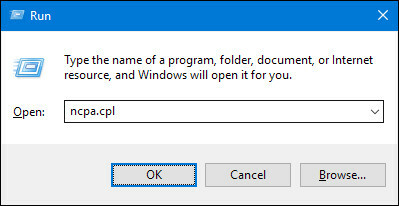 2) Enter “ncpa.cpl” and open the “Network Connections” window. 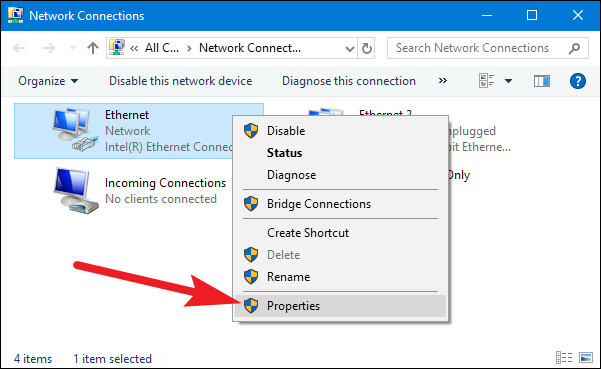 3) Right-click your computer’ network adapter and select “Properties”. 4) Select your computer’s Internet Protocol Version and click “Properties”. 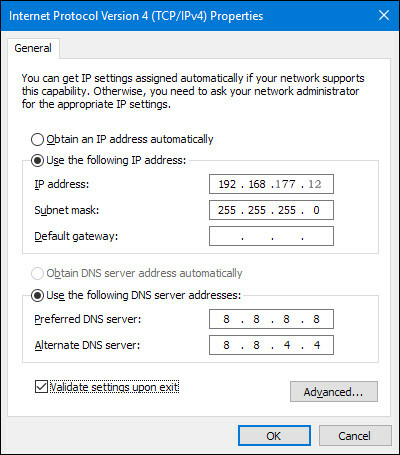 5) Select “Use the following IP address” and change the IP address into 192.168.177.12. And done. Now your IP camera is connecting directly and communicating with your PC, because they are now in the same little LAN. You can watch your IP camera with Reolink Client on your computer. Here’s the video footage shared by one of our customers. Important: Since there is no router network, the IP camera would not transmit data or send alarms to your phone. Still, you can record and save all the footage onto your computer. If you’re gonna use your IP camera with the computer all the time like this (without router network), you’d better change the default status of your IP camera’s IP address to the static to keep it the same all the time, because each time you reboot the IP camera, its IP address will be changed and you will need to do all the steps above again. 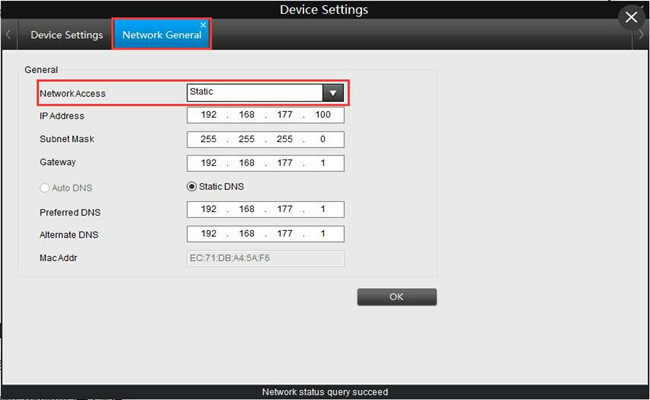 To keep the IP camera’s IP address the same all the time, head to “Device Settings” and “Network General” on the Client (Reolink Client in our test), and choose “Static” for “Network Access”. And done. If you do have WiFi network and need to remotely see the IP camera when you’re not there, you can connect your wireless or WiFi camera to computer wirelessly via your router. Step 1. Get your WiFi security camera charged. Use the power adapter to get the camera plugged-in and charged. Step 2. Use the network cable to connect to the camera and the router. A WiF camera needs to connect to the router with a network cable for initial setup, because the new camera itself wouldn’t recognize and auto-pick up a network that it never uses. Only after the correct WiFi settings can you disconnect the cable from the camera and the router. And yeah again, normally there would be a 2-in-1 or 3-in-1 cable attached from the WiFi camera. Find the network connector from that cable and use the network cable to connect to it. Then connect the other end of the network cable to the router. On the computer, launch the surveillance software to add the camera and watch live view directly. In our test, we open Reolink Client. Since the computer and the camera are in the same network (using the same router network), Reolink Client automatically searches and displays the camera directly. Click “Start” and you can view the camera on PC. And you can set up the configurations for all the functions you want the camera to have. Step 4. Set up WiFi settings and remove the network cable. Do remember to make the WiFi settings for the camera. On the software, navigate to “Device Settings” and “Network”. Choose the WiFi network and enter the password, and done. Cameras from different brand would have different WiFi settings. Please refer to the guides you get from your supplier. After that, remove the network cable, and then the security IP CCTV camera connects to computer wirelessly. Important: If you need to see the IP camera from another computer which is not in the same network, you need to input the camera’s UID into the software to remotely access the camera. Connecting a PoE wired IP camera to computer via router is similar to that of a WiFi camera, and even much easier – you don’t need to use a power adapter, set up the WiFi and remove the network cable. Step 1. Use the network cable to connect to the camera and the router. PoE (Power over Ethernet) means you can just use a single network cable for both video and power transmission. So just connect the camera to the router via the network cable, and the camera will get power supply and network access. Please make sure your router has the PoE feature. If not, try the next method. Step 2. Watch the IP camera on computer. In our test, we open Reolink Client. Since the computer and the camera are in the same network, Reolink Client automatically searches and displays the camera directly. Click “Start” and you can view the camera on PC. And you can set up the configurations for all the functions you want the camera to have. 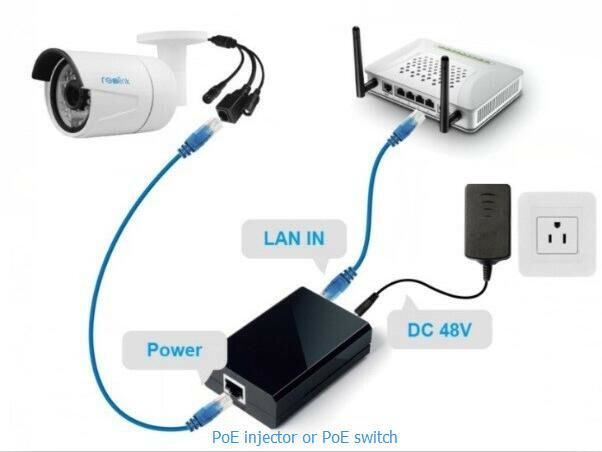 If your router does not support PoE, you need a PoE injector or PoE switch to help connect your IP camera to PC. Since the steps on how to connect a PoE IP camera to PC via PoE Injector/switch are quite the same to that of connecting without a PoE Injector/switch, we’d like to make it more simpler to understand here. Important: Once you connect the PoE IP camera to the PoE injector or switch which is connected to a router via Ethernet cables, you’ve successfully connect the camera to the network. For a wireless IP camera, you need to use a network cable to connect it to the router if you haven’t set up the WiFi network configuration. And then the wireless IP camera is in the network. You can set up the WiFi configuration later to make the wireless IP camera connect wirelessly. Make sure your wireless IP camera is connected to a power supply. Then on Reolink Client, add the camera and watch live view directly. If you need to see the IP camera from another computer which is not in the same network, you need to input the camera’s UID into the software to remotely access the camera. Reolink security camera systems, like the PoE kit RLK8-410B4, have their own proprietary networks, and can work with and without your router network. Step 1. Connect all the cameras to the NVR. When you receive the new IP camera system you bought, connect all the devices you got – connect the NVR to your computer’s monitor and the mouse, use the power adapters to charge the NVR and cameras, etc. For a WiFi system, once the WiFi NVR and the WiFi cameras are charged, they connected to each other automatically and would start communicate. For a PoE system, connect the PoE cameras to the NVR via the network cables provided. Step 2. Start watching the IP cameras. The startup and setup wizard will pop up to guide you to watch your cameras and do other configurations. Now you can see all the IP cameras on your monitor and start recording. Step 1. Do the step 1 showed above. Step 2. Connect the NVR to your router via the network cable provided. Step 3. Start watching the IP cameras. If you need to see the IP cameras from another computer which is not in the same network, you need to input the NVR’s UID into the software to remotely access the cameras. You can also opt for third-party software to connect and set up security camera on computer. Make sure the software can handle all the cameras on the network and support all the features for the cameras. Normally, the third-party software has several versions. And if you want to use full features of the camera, you need to pay for a premium version. If your security IP camera is not working properly as expected or if you get any issues, you can try the top 10 solutions to fix IP camera not working. For any questions, please don’t hesitate to leave it in your comment. I will reply as soon as possible. This entry was posted in Pro Tips & Fixes and tagged ip camera connection, laptop, Mac, pc. hi, how can i connect camera without any software? Hi Sureddin, a computer cannot read or talk or connect to a camera directly. Software is needed for you to connect the security camera to the computer. You can check if there is a software CD supplied with your security cameras or download the software on the company’s official website. Do i have have to switch up the computer every time I wanted to register(my PC just so I need to know) or will the camera do it anyway? Hi Angie, after you have connected your PC to the camera and completed the configuration, you don’t need to switch up the computer all the time when you want to register. You can also access the camera via your smartphones and web browsers. I CAN NOT ACCESS LOGIN ON CTRONICS SOFTWARE ? Hi there, make sure your camera is powered on for normal work. And then check whether the network connection is correct. If you still cannot access login on the software after trying this methods, you can contact the support team of the provider for help. Network connection is correct ? Hi, to successfully login on the software, you need to ensure your camera is powered on and verify the network connection. If the problem still cannot be solved after your check, I suggest you contact the support team of the provider and they would help solve your problem. How can I stream my Camera to my website? Hi, I’m not sure what security brand you are using. Normally the security provider will offer an IP address of the camera. Input the IP address of the camera in the address bar of the browser, and then enter the corresponding user name and password of the camera. After login, you are free to stream your camera on your website. Hi, if you have the IP address, then you simply need to input the IP address of the camera in the address bar of the browser, and enter the user name and password of the camera. After logging in successfully, you can get the live view on your website when your devices are in the same network. Hi, our cameras can achieve live viewing to the website through the above procedures. If that doesn’t work for you, you may contact the support team of your camera seller for assistance. 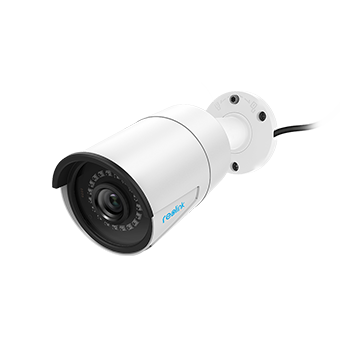 If you need to buy security cameras next time, consider Reolink as your top choice and we will try to deliver the best user experience to you. My camera is Reolink model is 410s. I have did everything in previous posts, still does not work on my website. It only works in live view on home computer, thanks. Any advice? Hi, are all your devices in the same local area network? The procedures above only apply for you if you want to watch live streaming in local LAN. If you want to remotely watch the live viewing on your website, please refer to this guide for assistance: /faq/remotely-access-reolink-camera-via-web-browser/. Hi, to better troubleshoot the specific issues, I suggest you contact our support team via email at support@reolink.com and explain your problem in details. They will help solve your issues as soon as possible. Thank you for your great support. Attach an audio/video cable to the back of the DVR and connect the other end of the cable to the computer. Power up the equipment and wait for your computer to display a “found new hardware” message. Then follow the prompts to launch your software for downloading DVR recordings to the computer or etc. Can I connect my IP camera to computer without a router? 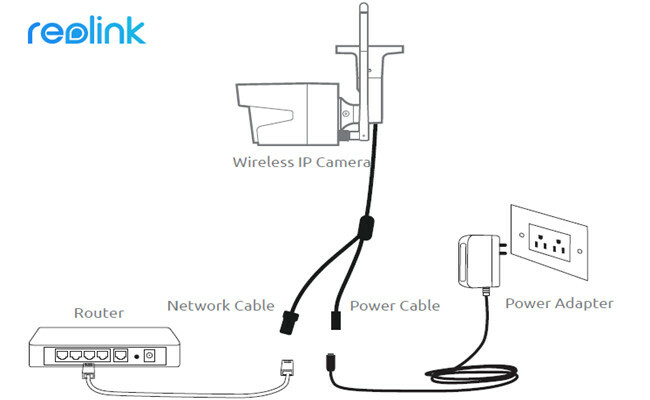 IP camera can be connected directly to PC via an LAN cable. 3. Go to IP address of your IP camera via Internet Explorer and you can view your camera. P.S. Some IP cameras will send you little software via network, so you must first install them. I already have 2 Reolink cameras, linked to my imac using Reolink software (I also use iphone app). The question I have is, can I use any ip Camera with Reolink software? I have been offered 2 other Non-Reolink IP camera’s for free, but want to know if they will work alongside my other cameras via the Reolink software? Hey Martin. No, Reolink software, including Reolink App on smartphones and Reolink Client on computers, is designed to work with Reolink cameras only. It would have been nice to know that before I spent an hour or two fiddling with your website. After setting up using the camera PC software does this software have to be running all of the time for the cameras to record on motion detection to disk. Yup. If you are planning to use a computer to monitor with the camera and record motion events, the software has to be running all the time on the computer. So we recommend NVRs (Network Video Recorders) or SD cards to go with a security camera. Well, that depends on whether your 4-channel wireless NVR has the function or not. If it supports connecting to the network wirelessly, it would connect to your hot spot, because most hot spots are 2.4Ghz WiFi. If not, you have to use a network cable to connect the NVR to your router. Hey Tim. Reolink software, including Reolink App on smartphones and Reolink Client on computers, is designed to work with Reolink cameras only. Hey Jody. To add a camera directly to PC, you can refer to the steps I mentioned in Method 1. It’s true that it may only help hook up one, because most computers have only one network port. See if yours has two or more. But if you have a router offering network for the computer and your 2 cameras, things would be much easier. You may refer to the other solutions I mentioned in this post. Step 2: Does this mean ALL network adapters should be turned off? If so, how is it that Step 3 is supposed to work? Obviously, the LAN adapter needs to be active, and others off. Step 3: What is my camera’s IP range? 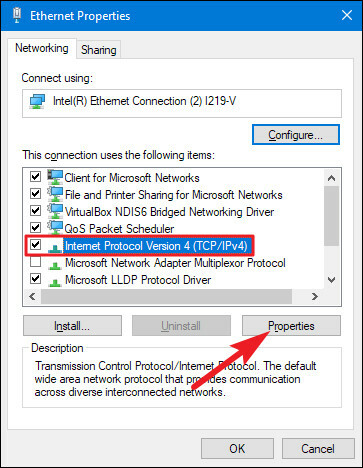 Without knowing this first, it is impossible to set up the TCP/IPv4 LAN settings in Windows. Without knowing this, the Roelink Client will not show connected devices. Step 4: I tried using the suggested 192.168.177.x, (192.168.177.12) this does not work. I had also set my adapter to 192.168.1.x, this too does not work, but yet, if connected to the router, this IP range does work. I do NOT want to connect to router, I want to connect to PC. Neither of the above methods work. The ‘Add Device’ (step 3) shows nothing connected. Everything is working, except for WiFi. What is the Camera’s WiFi adapter MAC address? Is it the same as the LAN address or different? How do I find out? In the Client software, Device Settings, WiFi settings (or even Network General), it should really show the MAC address of the camera’s WiFi. I have tried several Routers, but every time I click on Wi-Fi Test, all I get in return is “Wi-Fi Test failed!” Some routers have MAC filtering [I have allowed the MAC address, but is the WiFi MAC the same or different? ], some do not. am using the supplied power adapter, only methods 1&2 apply. Firmware has been updated as of May 1st 2018.
a). Problem 1, method 1, step 2. I think it’s so clarified: if your computer has network already, disable it – so you need to turn off the network of YOUR COMPUTER. Many ways to do this – 1. if it’s a desktop computer, to disconnect the wired Ethernet network, unplug your Ethernet cable from its jack; 2. if it’s a laptop and it’s connected to the network wirelessly, to turn off the WiFi connection on the laptop, right-click the “Wireless Connection” icon and select “Disable”; and etc. If you’re using other cameras from other brands, there should be some kind of software like Reolink Client to do the same job. 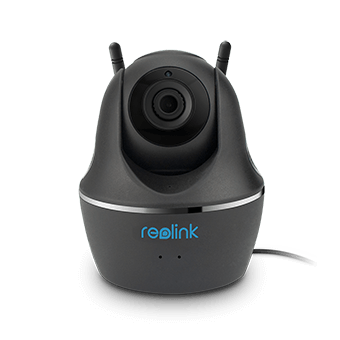 Please note that Reolink Client only works for Reolink cameras. In our test, we use a Reolink cam, so we use Reolink Client to do the job. There’s no “suggested” IP address, in the post, we’ve already clarified that we’re showing our test. So it’s just an example to show you the steps. The exact information should be based on your actual situation. Pls refer to the step 3 you’re done and use the IP address according to what you’ve get. In Method 3, you don’t need the camera’s powered adapter to do the work, because a network cable will do for both power transmission and video transmission. The camera’s powered adapter can only do the job of power supply for the camera. So in Method 4, if you’re saying the power adapter does not work, the camera won’t work (because the camera can’t ever get power supply.) So it’s very very very weird that it’s working in method 1 and 2 but not in method 4. Please check if actually the power adapter works. Hi, Christy, please refer to this expert guide here /ip-camera-address/ for the detailed steps about how to find the IP address. Hope this would help. so has anyone got the funlux ip wifi camera to connect to there computer via wifi? funlux said it is impossible to do. i want the port numbers so i can get it to work on my tinycam app. and my pc app. but funlux will not give out the port. funlux has to be able to connect thru my home inside my network being i see my modem . i have the ip address for this camera but can’t find the port it uses.